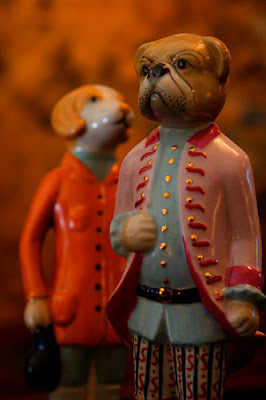 So what are some dogs we'd see in the 18th century? 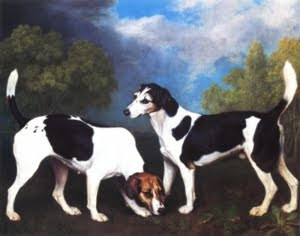 Foxhounds and Beagles are the be expected, but many kinds of spaniels and setters were also popular. 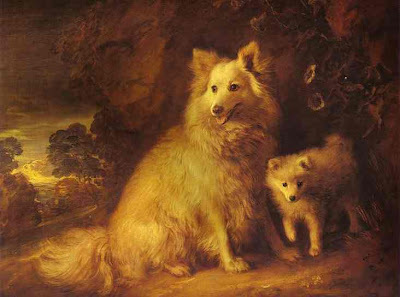 Many dogs were bred for specific kinds of hunting - for instance, standard poodles were for hunting bears, while terriers were for vermin, badgers, and rats. 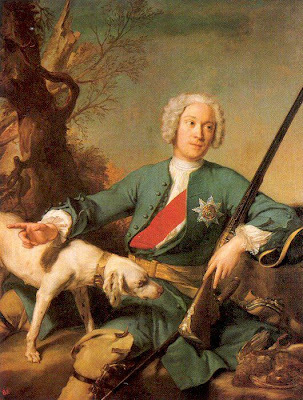 Greyhounds and whippets were used to course rabbits, and hounds to bring down stags and boars. A hound, although looks a bit like a spaniel, with those ears. A hound - a pack of these would have been used to run down this stag. 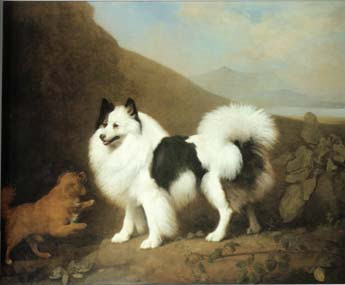 This is Fino, the Prince of Wales' pomeranian. 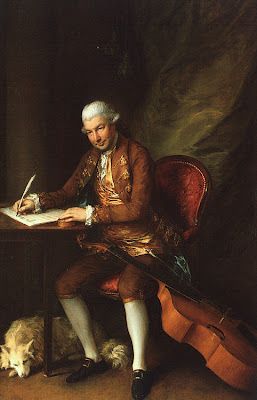 A delighful painting by Fragonard (if not a little voyeuristic?). Not sure of the breed, but looks like some kind of poodle? 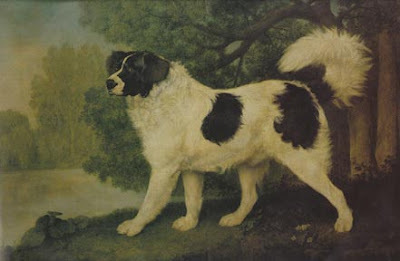 Of course, many many other breeds were in England and throughout Europe in the 18th c. Greyhounds were ever popular with the upper classes, and large working breeds such as Newfoundlands, Collies, and Sheepdogs were useful to the lower classes and bourgeoise. 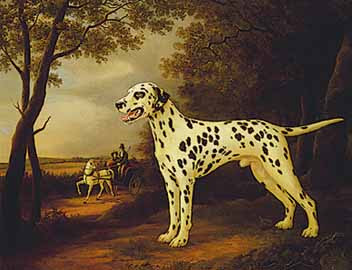 Interesting breeds such as the Dalmatian were used to accompany carriages (this is where the ubiquitous Fire Engine Dog image comes from), while Mastiffs, bloodhounds, and bulldogs were employed by the police to help keep order. Dalmatian, with the carriage in the background. For thousands of years dogs have been our companions and assistants. It's fascinating to see them appear in portraits, next to famous 18th c. figures, or all on their own. 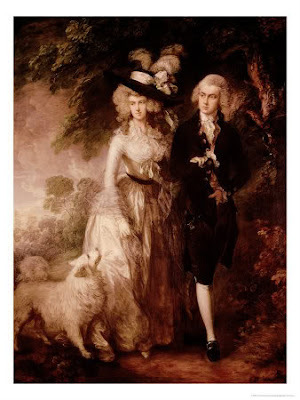 They were as beloved and essential to the people of the 18th c. as they are to us today (perhaps moreso), and ought not to be overlooked when we think back on and study this time in history. The American Kennel Club akc.org and Dog Breed Info Center dogbreedinfo.com have information about breeds and origins. Usually the Dog Breed Info Center has more information about origins etc. I've always wanted a Cavalier King Charles Spaniel. What an appropo post considering our last discussion. 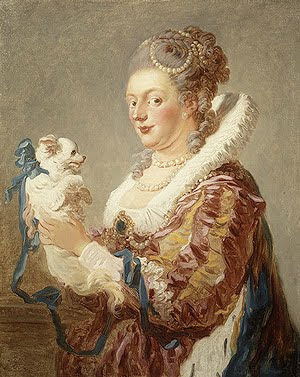 Reinette and I have enjoyed all the dog portraits posted here. 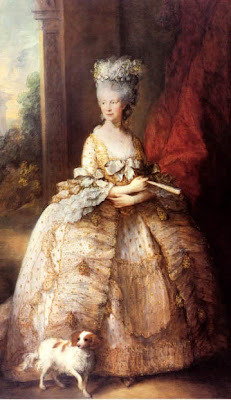 Oddly enough the Cavaliers (like her) were bred in the modern era to look like the spaniels in the portraits because the original breed had died out. Anna, you're totally right, and dog origins are super fascinating - there are so many breeds in Europe we don't have in the USA. 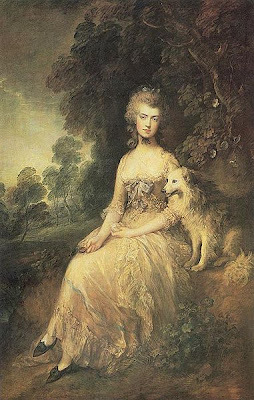 Beautiful paintings and beautiful dogs. 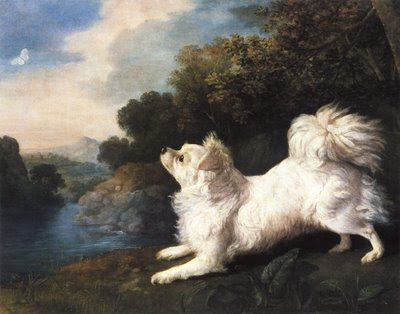 I wonder how the artist got the dogs to sit and behave for the length of time required to capture their image? But what about the 18th century cat? Surely they weren't relegated to the barn for a life of catching mice. Robin, I can't help but love sighthounds (Avi being of that same general shape). I could do a sketch of you two, if you like, if I have photos of the both of you (don't have to be together). I think the second dog painting is a Cavalier King Charles Spaniel not a Brittany. Great history information! Miss K, it does look just like one. 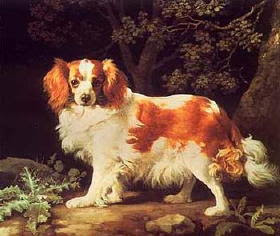 All the description said was that it's a "spaniel" by stubbs, and the Comtesse in her comment above mentions that modern Cavaliers were bred in modern times because the original breed had died out. 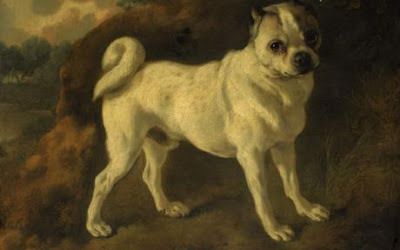 I wonder if they were similar to the pomeranian and pug in that they looked rather different? I do agree, though, it does look spot-for-spot like a King Charles. 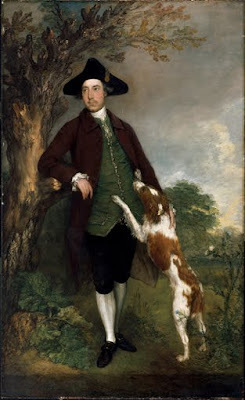 The dog in the Gainsborough painting looks like an Irish red and white setter. This was the original Irish setter, from which red Irish setters were bred. 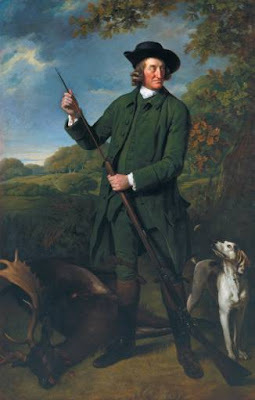 They are frequently depicted in 18th Century hunting/pastoral scenes, often paired with a Gordon setter.